I found a link to this little top at Corrie's blog. She has a couple of these little cotton tops made for her little girl, Keira. 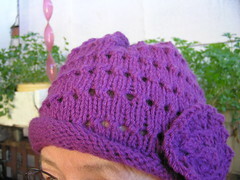 It's an easy, top down knit and will be a present for one of my granddaughters. This one is made from Wendy Supreme Cotton 8 ply. It's a 'crunchier" cotton than that from Bendigo but is still easy to knit. The morning was fairly dark. The colour is a pretty colour, light blue with an aqua tinge to it. What is even better is that this is stash yarn. I found two balls of it in amongst my cottons. 100 gms each, 219 metres. I bought it at Greta's I think, or perhaps at Hornsby quite a while ago. 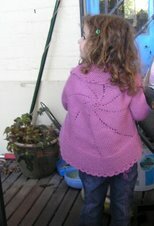 It was reduced from almost $11 to $6.45, so it's a cheap little top which will be added to Christmas presents. That's a very cute top, Love the top down-edness and such a bargain too!! I admired those tops on Corrie's blog too. Just gorgeous. I know a little miss who's going to get some of those!